One Owner, Keyless Entry, Air Conditioning, Cruise Control, Power Door Locks! Hurry on this one! Marked down from $29995 - you save $3000. Few vehicles have such broad appeal as a full-size pickup and the Ram 1500 is no exception. 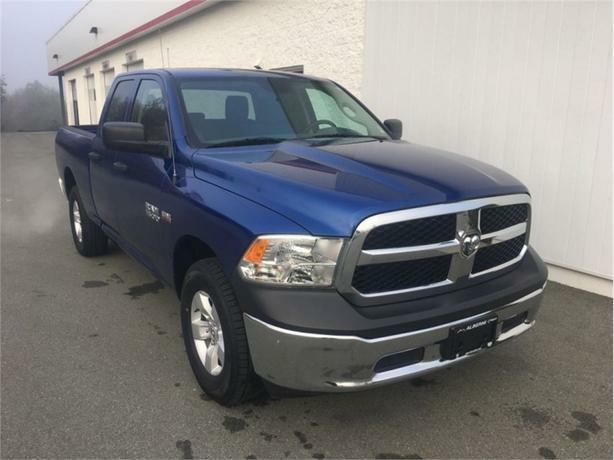 -Car and Driver This 2015 Ram 1500 is for sale today in Port Alberni. The reasons why this Ram 1500 stands above the well-respected competition are evident: uncompromising capability, proven commitment to safety and security, and state-of-the-art technology. From the muscular exterior to the well-trimmed interior, this truck is more than just a workhorse. Get the job done in comfort and style with this Ram 1500. This Crew Cab 4X4 pickup has 46689 kms. It's blue in colour and is major accident free based on the CarProof Report. It has an automatic transmission and is powered by a 5.7L V8 16V MPFI OHV engine. This vehicle also has the following features: One Owner, Keyless Entry, Air Conditioning, Cruise Control, Power Door Locks, Power Windows, Tow Package. It has some remaining factory warranty for added peace of mind. Our 1500's trim level is SXT. The SXT trim adds some nice features to this truck while still being a great value. It comes with SiriusXM, a media hub with a USB port and an aux jack, air conditioning, cruise control, a front seat center armrest with three cupholders, power windows, power doors with remote keyless entry, six airbags, automatic headlights, aluminum wheels, and more. To view the original window sticker for this vehicle view this http://www.chrysler.com/hostd/windowsticker/getWindowStickerPdf.do?vin=1C6RR7FT0FS771053.